Connect MonkeyLearn to Gmail, Twitter, Slack, CRMs and over 900 more apps. No coding skills required. 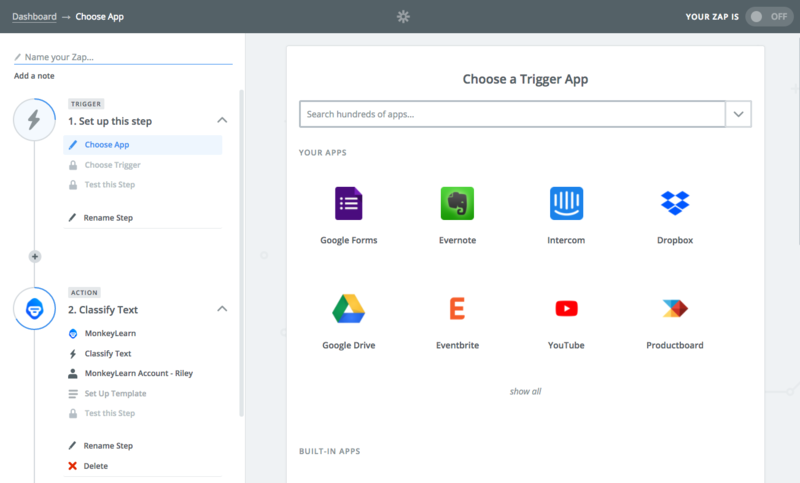 Zapier is an online automation tool that allows anyone to connect their favorite apps on the internet using triggers and actions. It's great for automating repetitive tasks and the visual interface makes it easy to build "Zaps". With MonkeyLearn, all your text processing can be handled. You can build a process to automatically classify or extract text, train a model, deploy it, or upload new samples. See some examples here 💡. To build Zaps with MonkeyLearn, you will need to do is connect your account in Zapier with your MonkeyLearn account, and then you will need to use the model ID of whatever model you want to process text with. A trigger can come from anywhere: perhaps it's a new tweet, a customer support ticket, an email response, a new article, etc. When you set up a Zap you can define what the trigger is, what action you would like to take with MonkeyLearn, and finally, what the output looks like (perhaps via email, Google Sheet, or a message on Slack). When you are finished creating your Zap, you can turn it on to have Zapier automatically process new text when the trigger is set off. You can get started with Zapier for free. Make your own Zap or see some templates we've already set up. To detect if incoming tickets are urgent or not. If they are urgent, tag them as urgent. (See our guide on how to build your own Urgency Detector). Get a new email response, detect if there is positive interest, send a response automatically. Get tweets from a specific list of influencers, use MonkeyLearn to detect topics in all of them, filter them for topics we are looking for, and export those tweets into a Google Sheet. Pull in a new articles via a RSS feed, extract keywords and entities from those articles, export the keywords and entities to a Google Sheet so we can play with the data. Get a new piece of feedback from Delighted, use our opinion unit extractor with MonkeyLearn to itemize and classify the feedback, then share it with our team on Slack.